What are the Usual Values of Specific Gravity of Soil? We have all know the specific gravity who deals with civil engineering problems; other fields also use this term. This is a ratio that compares mass of specific volume of soil to mass of same volume of water. The water volume is considered at 40C temperature. Sometimes specific gravity is denoted as Gr. In defining specific gravity of soil mass of solids for a given volume is considered. We know soil is a heterogeneous material having different particles in same soil mass of our concern. Different particles have different specific gravity. So when we said that specific gravity of soils is 2.65, we are defining an average specific gravity of all solids present in soil mass. Specific gravity of soil is a very important parameter which is used to determine particle size and void ratio. 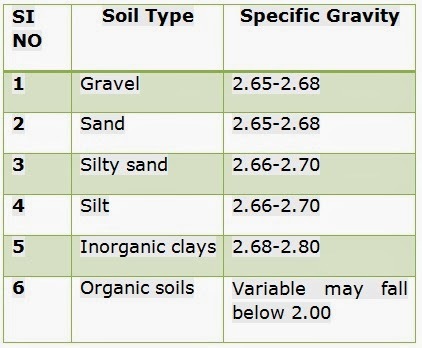 The usual values of specific gravity of soils lie in between (2.65-2.80). This is a unit less parameter. The smaller values stand for soils of coarse grained particles.